A Wayne State University research project aimed at improving seizure detection in epilepsy patients is one of six finalists selected for the sixth annual Shark Tank Competition at the 2017 Antiepileptic Drug and Device Trials Conference, which will be held May 17 through 19 in Aventura, Florida. 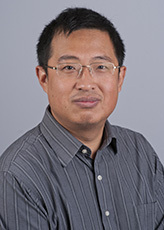 Ming Dong, associate professor of computer science in the Wayne State University College of Engineering, is the co-principal investigator on the project. Maysaa Merhi Basha, associate professor of neurology in the School of Medicine, is the principal investigator. Their project, "The Sound of Seizures: Audio-triggered seizure detection,” proposes a method of identifying and capturing seizure-specific sounds such as ictal cries or grunting in a monitoring unit. A proprietary signal-processing software can be used to create an electronic signature for each sound type, which can be embedded into a smartphone app that triggers a notification when a seizure occurs to alert caregivers. The goal of this research is to reduce the risk for respiratory distress, physical injury or sudden death in epilepsy patients who experience frequent generalized tonic-clonic (GTC) type seizures. Finalists receive a minimum award of $5,000, and Basha and Dong have an opportunity to compete for a $200,000 grand prize at the conference.